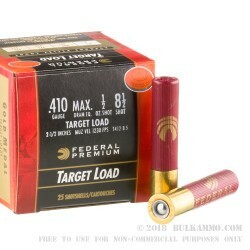 These .410 Bore shotshells from Federal comprise the very best components and quality control methods available in order to help discerning sportsmen and sportswomen line their walls from plaques and trophies! The Gold Medal series of match-grade ammunition undergoes additional post-production inspection with every lot. This ensures that the moisture-resistant hulls, clean-igniting 209A primers, and high-energy propellant grains all exhibit the correct dimensions, burn rate, and volume. In effect, each of these rounds will exhibit consistent performance and dependable function. 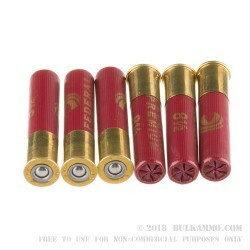 This shotshell load carries a half ounce of #8.5 shot. Many sportsman choose this particular size as a compromise between #8 and #9 that delivers ample energy with a decent density and spread. While it's not plated, this shot undergoes a hardening process and is placed within a split-wall wad in effort to maintain round shapes during the firing process. These efforts contribute to tighter patterns and cleaner, more spectacular breaks on clay pigeons. 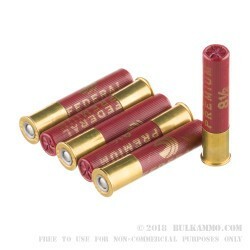 Federal ammunition is American made and held in high regard due to its proven results on big hunts, in law enforcement records, and at Olympic shooting events.